ALEM GENA, Ethiopia (WPR – World Politics Review)—As she shuffles about the factory floor, watching over the machines that weave spools of thread into fabric, Asrat Yimam personifies the future of the Ethiopian workforce. A 27-year-old mother of one from the nearby capital, Addis Ababa, Yimam has spent the past six years toiling for Ayka-Addis, a Turkish-owned textile and garment factory and the largest firm in Ethiopia’s emerging apparel industry. Six days a week, for 1,500 birr ($68) a month after taxes, she rises early for her eight-hour shift, dons her spotted blue and white Ayka uniform, and spends her day churning out cotton for t-shirts, pajamas and bed sheets bound for Europe. As a relatively senior employee, she’s better paid than many of Ayka’s 6,000 Ethiopian staff. With her 10th-grade education, she admits it would be hard to find better. Yet Yimam and her husband still struggle. “There aren’t many companies that pay more than Ayka,” she says over the whirl of more than 200 knitting machines. “But it’s still barely enough. Today, in a country where more than three-quarters of the workforce is engaged in small-scale agriculture, Yimam’s job as a cog in the global rag trade is still a relative novelty. Despite recording one of the world’s highest rates of economic growth over the past decade, Ethiopia remains an industrial laggard even on the world’s least-industrialized continent. As of 2015, the country of 97 million inhabitants derived just 4.6 percent of its GDP from manufacturing, less than half the sub-Saharan African average. Over the past 12 months, instead of realizing a long-envisioned boom in industry, Ethiopia has faced twin reminders of its dismal past: a drought and hunger crisis worse than any since its infamous famine of the 1980s; and unrest within its largest ethnic community unlike any in the quarter-century since the end of its 17-year civil war. trade—an “African Lion” alternative to industry-leader China, where wages are quickly becoming uncompetitive. Already, “Made in Ethiopia” garments can be found on the racks of global retailers like H&M, Wal-Mart and Tesco. In the coming months, the U.S. sourcing giant Phillips Van Heusen (PVH), which owns brands like Calvin Klein and Tommy Hilfiger, will begin operating from a new 130-hectare industrial park in the southern Ethiopian city of Hawassa. It will be joined by 10 other leading textile and apparel firms from India, Sri Lanka, Indonesia, Hong Kong and China. According to Arkebe Oqubay, a special economic adviser to Prime Minister Hailemariam Desalegn, the park is expected to generate 60,000 jobs and $1 billion in export earnings from textiles and garments—nine times the sector’s current level—once it reaches full capacity in the next few years. At least eight other government-financed parks, intended for textiles, apparel, leather, pharmaceuticals and food processing, are under construction or being planned across the country. Already, “Made in Ethiopia” garments can be found on the racks of global retailers like H&M, Wal-Mart and Tesco. Should Ethiopia’s push toward manufacturing prove even partially successful, it would stand out on a continent where industrial development has long trailed other regions. Over the past 15 years, the economy of sub-Saharan Africa has more than doubled in size, growing at a rate of roughly 5 percent a year, and fueling the widely adopted narrative that the world’s most underdeveloped continent is finally “rising.” The bulk of this growth, however, has been driven by years of high commodity prices, as well as the expansion of services like banking, construction, hospitality and telecommunications. Unlike the high-growth Asian economies of recent decades, which achieved high standards of living by shifting labor en masse from low-productivity agriculture to higher-productivity jobs in factories, Africa, by some measures, has actually deindustrialized. Between 1975 and 2014, the share of manufacturing in sub-Saharan Africa’s GDP fell from 18 percent to 11 percent. Today, the continent as a whole is responsible for less than 1 percent of global manufacturing exports. This poor performance is largely the result of acute challenges at home, such as corruption, civil unrest, unfavorable geography and long-neglected energy and transport infrastructure. Yet Africa has also been a victim of Asia’s rise. In the years following independence, many African states had kick-started the industrialization process by adopting policies of “import substitution” that utilized trade barriers and support to infant industries in a bid for self-reliance. By the time of the “Asian miracle,” however, most had liberalized their economies and opened up trade as part of World Bank and International Monetary Fund-induced structural adjustment reforms. Soon, Africa was flooded with low-cost Chinese imports. Many of its existing manufacturing hotspots, like northern Nigeria’s once-thriving garment sector, began to founder. Despite recording one of the world’s highest rates of economic growth over the past decade, Ethiopia remains an industrial laggard even on the world’s least-industrialized continent. For a continent in the midst of a population boom, this would be a critical development. With fertility rates still high, Africa’s current population of 1.1 billion is projected to double by 2050. Moreover, 70 percent of sub-Saharan Africans today are under the age of 25, which means the workforce will grow tremendously in coming decades. For all the buzz surrounding Africa’s growth in services, and the possibilities offered by the continent’s embrace of tech, history has shown that the most effective way to absorb excess labor and boost worker productivity is through a sustained shift toward labor-intensive industry. Aside from a handful of Gulf oil producers and tourism or finance-oriented microstates, no country on earth has managed to achieve a high standard of living without putting large numbers of workers into factories. Nowhere in Africa is the drive toward industrial development as deliberate as in Ethiopia. Much of this is the legacy of the late Prime Minister Meles Zenawi, the former guerilla fighter who ruled the country from 1991 until his death in 2012. Despite readily accepting foreign aid, Meles was one of the few African heads of state in the 1990s to openly reject the Washington Consensus, describing the dominant neoliberal paradigm as a “dead end.” Instead, he argued, development in Africa required an activist state, which could overcome a lack of comparative advantages by guiding investment toward targeted industries and effectively forcing long-term value creation. Meles looked in particular to models from Asia, including those of China, Japan, South Korea and Taiwan, which had all succeeded, to varying degrees, by shunning neoliberal dogma and using the state to capture rents that could be channeled toward industrial development. In a similar manner, Meles’ “developmental state” was built on the government’s pooling of savings into investments in areas deemed critical for long-term growth, including roads, railways, electricity, agriculture, health care and education. By improving tax collection, shutting out foreign banks and refusing to privatize telecommunications, the government managed to mobilize domestic resources at a scale never before seen in Africa outside of a commodities-driven context. Along with foreign aid, this enabled Ethiopia to boost public investment from 5 percent of GDP in the early 1990s to 19 percent in 2011—the third-highest rate in the world. It also fueled robust economic growth and improvements in human development. Although many Ethiopia watchers question the official numbers, government statistics show that GDP has grown by 10.9 percent per year since 2004, and poverty has fallen by 33 percent since 2000. Critically, these investments have also forged the building blocks of industry. Arkebe, who wrote a book about Ethiopia’s industrial policy and has been its most prolific champion since Meles’ death, presented a laundry list of key achievements in an interview from the Prime Ministerial complex. Since coming to power, the ruling Ethiopian People’s Revolutionary Democratic Front (EPRDF) has established 34 public universities and 1,350 post-secondary technical schools as part of a new German-inspired system that stresses vocational training. It has also invested widely in strategic infrastructure. A Chinese-built electric railway connecting Addis Ababa to the nearest port in Djibouti—one of several rail lines under construction—is expected to begin operating in the coming months and drastically reduce the shipping costs of exporters. Nowhere in Africa is the drive toward industrial development as deliberate as in Ethiopia. A sustained investment in hydropower, meanwhile, in concert with subsidized tariffs, has helped Ethiopia offer electricity at one of the lowest rates in Africa. Along the Blue Nile in the country’s northwest, thousands of workers are building the $5 billion, 6,000-megawatt state-funded Grand Renaissance Dam, which will be Africa’s largest hydroelectric facility upon completion. In the coming years, once this and other large-scale projects come online, Ethiopia is expected to pass Nigeria as sub-Saharan Africa’s second-largest power producer. Translating that infrastructure into assembly lines, however, has proved more difficult than expected. Ethiopia’s first five-year Growth and Transformation Plan, launched in 2010, targeted the construction of five state-financed industrial parks by 2015, as well as 22 percent annual growth in manufacturing output. Today, only one park, in Addis Ababa, has been completed, and the sector has grown by less than half that, roughly at the same rate as the economy as a whole. Foreign investment—essential to the industrialization process—remains held back by the challenges of doing business in the country, among them an excessive bureaucracy. According to the World Bank, Ethiopia ranks 39th out of 47 sub-Saharan African countries in the ease of starting a business. Investors complain that merely obtaining a needed signature can take months. Increasingly, however, outside firms—including manufacturers—are taking a chance on Africa’s second-most-populous country. Ethiopia’s foreign investment flow, near zero when the EPRDF took power, has grown to average more than half a billion dollars in recent years, reaching an estimated $1.5 billion in 2015. In addition to low electricity costs, the promise of sourcing local raw materials has drawn many investors. The Chinese shoemaker Huajian, which established a factory on the outskirts of Addis Ababa in 2012, came in part because of Ethiopia’s large supply of leather: By some estimates, it has the largest stock of cattle on the continent. The wage differential with China was also essential. Huajian’s 4,000 Ethiopian staff, which churn out 3 million pairs of shoes per year, mainly for the U.S. market, earn a minimum of 600 birr ($27) per month, one-sixth of the rate at the company’s two plants in China. Huajian’s experience has been positive enough that the company plans to build an entire new industrial zone: a small city, as Zeng describes it, that is shaped like a boot and will accommodate 30,000 to 50,000 jobs in shoemaking, leather processing, garments and textiles. It is not alone in eyeing Ethiopia’s apparel sector. In a 2015 survey by the management consultancy McKinsey, 36 of 40 international apparel firms polled said they planned to source garments from Ethiopia by 2020. (At least a quarter of those surveyed also planned to source from Kenya, Mauritius, Lesotho, Madagascar, Uganda and Tanzania). According to the report, Ethiopia’s draw, aside from the low cost of inputs, stems from duty-free agreements with the EU and U.S., as well as the availability of 3.2 million hectares of land with a climate appropriate for growing cotton. Recent stagnation of cotton production and concerns over local quality mean that many existing textile producers, including Ayka, still rely extensively on imports. The government, however, says it is targeting an overhaul of the cotton sector, in part through the use of genetically modified seeds, which parliament approved for use last year. Yet it is the industrial park strategy, now finally making tangible progress, that could be the most important catalyst of the sector. Aside from offering tax incentives, the parks will provide companies with ready-made production sheds, a reliable electricity connection, on-site waste-management facilities and one-stop shops to handle administrative tasks and reduce delays associated with bureaucracy. The nearly completed park in Hawassa, intended as a model for the eight other government parks to come, could alone enable Ethiopia to pass Mauritius as the region’s leading textiles and garments exporter. The $1 billion in annual exports its planners believe it can generate represents just a fraction of the $800 billion global export market. Nonetheless, the arrival of major buyers like PVH is likely to send a signal to others that the country’s sourcing prospects are legitimate. In addition, as firms sourcing from China, which is responsible for more than a third of global exports in the sector, increasingly seek alternatives elsewhere, the opportunities for growth are seemingly endless. Even if this takeoff is realized, however, the economic transformation envisioned by Ethiopia’s planners is still incredibly ambitious. 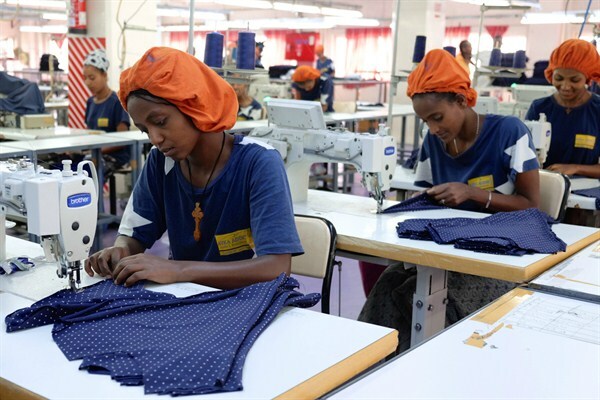 In an ideal scenario, Arkebe says, the manufacturing sector will add 200,000 jobs per year—a major scale-up, yet only a fraction of the more than 2 million Ethiopians entering the labor force annually. Another goal, he notes, is for manufacturing to reach 20 percent of GDP within a decade—a level where many Asian countries stood around 1980. Assuming overall growth in line with recent trends, however, this would require the sector to expand each year by more than 25 percent. This challenge is exacerbated by a shortage of foreign currency, linked to spending on the country’s many infrastructure megaprojects, which makes it harder for the state and domestic firms to purchase needed foreign-sourced inputs. Ethiopia’s emergence as an important garment-sourcing destination also comes at an awkward moment. Over the past year, an El Niño-induced drought has led to the country’s most severe food crisis since its infamous 1980s famine. With more than 10 million people in need of or relying on food aid, nearly half a million children facing severe malnutrition, and torrential rains now causing deadly foods and landslides, the situation hardly resembles a country on the brink of transformation. Although better roads and a national food security network have aided the emergency response, the crisis has also undermined the EPRDF’s narrative of progress. The new Addis Ababa-Djibouti railway, a potent symbol of this contradiction, was meant to herald the growth of an industrial economy. Instead, it has been utilized before its official opening to deliver emergency relief to drought-affected areas. It remains to be seen, however, to what extent the crisis represents a threat to the country’s industrialization efforts. In a concession to the protesters, authorities announced in January that they would cancel the Addis Ababa urbanization plan, a move that would presumably hinder further growth of the city’s industrial footprint. Already, however, authorities had planned all but one of the new state industrial parks for other parts of Ethiopia—a deliberate move to limit the capital’s expansion and promote more-balanced growth across the country. Ethiopia, which is less culturally homogenous than many of the Asian states it seeks to emulate, is emerging from a period of unprecedented ethnic discontent. Critically, though, the episode raises larger questions about the compatibility of the developmental state, which requires centralized control, and Ethiopia’s decentralized federal system. Ethiopia’s constitution, which was designed to mitigate historical fragmentation among the country’s different “nationalities,” gives extensive control to the governments of the nine ethnically based regions to both plan and implement policy decisions. In practice, critics say the EPRDF, like all the regimes of modern Ethiopia before it, governs the country in a top-down manner that severely restricts political opposition as well as the autonomy of its regions. The party and its allies, which control all 547 seats in parliament, are largely unencumbered by dissenting voices. According to Gudina, many in Oromia and elsewhere interpret the developmental state not as a driver of progress, but as an imposition crafted by a small ruling clique in Addis Ababa. In particular, many resent the control of Meles’ ethnic Tigrayan minority, which continues to have disproportionate influence in government, business and the military. A major risk, he and other critics say, is that development policy that continues to be dictated from the top, without adequate local participation, will only cause further splintering across the country. Whatever the risks of Ethiopia’s chosen development path, one thing appears certain: The country’s drive to industrialize will have a significant impact on the lives of millions of its citizens. Whether spinning machines and assembly lines can be harnessed in the best interests of those laborers, however, remains an open question. Although a poorly paying job may be better than none at all, the importance of low wages in attracting investors to the country is a concern for many human rights activists and labor leaders. Today, Ethiopia has no national minimum wage in the private sector. According to Angesom Yohannes, an official with the Industrial Federation of Textile, Garment, Leather, and Shoe Workers Trade Unions, fewer than 10 percent of the country’s 350,000 workers in these sectors belong to unions. Ayka’s 6,000 staff are an exception. There, an active workers’ union has succeeded in raising the company’s minimum wage to 990 birr per month ($45). With the help of periodic strikes, the union has also negotiated annual salary increases and has helped propel more Ethiopian staff into management positions. Tanju Kavlakli, Ayka-Addis’ general manager, says the union’s presence helps boost worker morale and provides its staff an opportunity to air their grievances. Still, their comparatively low efficiency and the low-margin nature of the business mean that there are limits to wage concessions. For workers like Teshale Yohannes, this means that life is a daily struggle. A machine operator from southern Ethiopia, he came to Ayka in 2012 because the company offers free lunch and transport—perks unavailable in his previous job at a steel factory. Still, he says, he struggles with the heat of the textiles plant and worries about his exposure to chemicals. (An Ayka safety inspector, who listens to Teshale’s concerns, insists his job does not involve exposure to anything toxic). Most importantly, Teshale says, the pay is simply too low. After rent, his salary leaves him with just 450 birr a month ($20) to support his wife and child. *Jonathan W. Rosen is a journalist specializing in East Africa and Africa’s Great Lakes Region. His reporting for this story was funded by the Alicia Patterson Foundation.